Description: Served the local grain elevator along the TPW main. Description: UP 1202 sits at Grainland Cooperative in Cruger Illinois. The wind was blowing so hard this day I was having a hard time standing still just to take some photos of this thing. 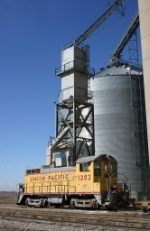 Description: Switcher that serves the grain elevator in Cruger. Description: Another view of UP 1202 as it sits next to the TPW main. Description: Im amazed this thing is still lettered for UP. Title: Sent to the possible rescue! Description: IORY 4011, in the background is ex-UP 1202, an SW10 now owned by Cruger Elevator. It has not been relettered or renumbered. Description: TPW 3830 heads east light power past the former UP 1202.